Looking for a Little Tikes log cabin playhouse? A fantastic, traditional-looking log cabin playhouse with charming shutters, stable door and even a phone! 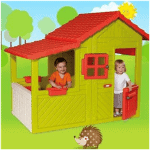 This is a playhouse that will provide hours of endless fun and adventures for children, both boys and girls, aged 2 years and upwards. 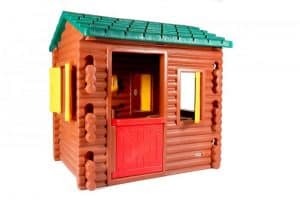 This is a beautifully crafted plastic log cabin Swiss styled playhouse with a bright stable door and two feature opening windows with co-ordinating yellow shutters. The bright green apex style roof really shows off this playhouse and the children will enjoy playing inside for hours – there’s even a make believe phone inside! The UV resistant plastic means that the house will never dull down and always look good and low maintenance materials means a quick spritz with the hose will easily keep this nice and clean. A wonderful purchase all round. This lovely little log cabin playhouse is like something out of a storybook. In beautiful, traditional colours this house will blend into its natural surroundings perfectly. It is slightly smaller than other playhouses in the range but it is definitely big enough for children to enjoy for many hours of fun. The addition of a phone makes the house more exciting for young children who will love the idea of being able to phone mum from their house in the garden. 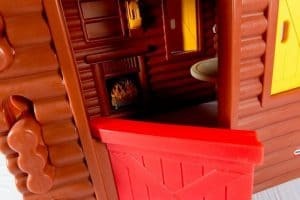 Little Tikes Plastic Log Cabin Playhouse: How safe is it? 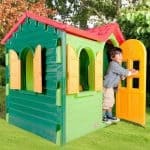 The Little Tikes playhouse range provides imaginative designs and strong, durable construction and this house is no exception. This playhouse looks great from the outside but are there any safety issues that parents need to be made aware of? Below we examine and discuss and safety issues that may arise with this particular model. Overall: The house itself is made from chunky, lightweight plastic, the ideal materials for a playhouse that is both durable and safe for little children. Windows: The windows have a charming shutter design that small children will love opening, closing and peeping out of. Little Tikes is clearly aware of this and has included in-built handles into the shutters to ensure ease of use for little hands and to avoid any trapped finger accidents. Door: The door is designed to mimic a stable door and therefore can be opened easily on the top, again avoiding any accidents with small fingers. Phone: The interior feature of a phone inside the playhouse is a wonderful feature for this house. Again, the phone is plastic and chunky in build, with no small parts to tell of. Generally, this particular model of playhouse has quite a simplistic design with the only real feature being the interior phone and table. 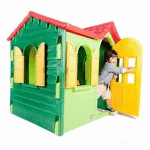 There is nothing that would particularly concern parents, in fact due to its simple design it is one of the safest playhouses in the Little Tikes playhouse range. 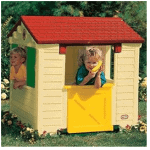 This is the playhouse for your child if you are in any way concerned about safety issues in playhouses. 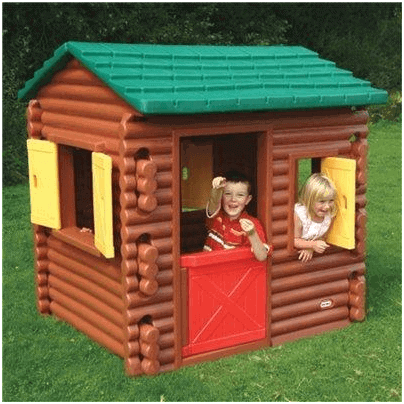 Little Tikes Plastic Log Cabin Playhouse: How easy to build? So this playhouse is ticking all the boxes so far, but just how easy is it to build? Well actually it comes top of the class again because this playhouse, just like all of the Little Tikes range is incredibly easy to put together. With no tools required and the Little Tikes click and build technology, follow the clear and concise instruction manual to build your little one’s playhouse in no time at all. No tightening needed as once all the pieces are clicked together they will be completely secure with no movement to concern yourself with. Little Tikes Plastic Log Cabin Playhouse: What is the overall quality like? As a parent of a preschool child it is unlikely you haven’t already heard of the Little Tikes brand. As American toy manufacturers with manufacturing and distribution across the globe, the Little Tikes name is synonymous with high quality products. 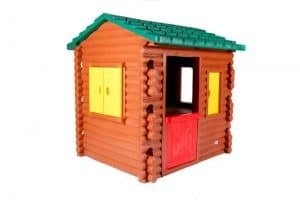 Little Tikes playhouses always rate highly amongst the whatshed.co.uk team and our customers, but will the Little Tikes Log Cabin playhouse be just as good? Of course it will! This is a fantastic, traditional log cabin house without the wood logs….and the splinters! This particular house certainly rates highly in the appearances stakes, reminding us of something out of the Swiss Family Robinson tales. Durable, built to last and easy to clean – surely the things at the very top of a parents list of things to look for when purchasing a playhouse? The playhouse itself is virtually maintenance free and should it get dirty then just give it a quick hose down to restore it back to its original condition. 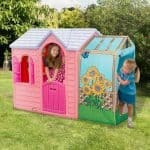 Our final thoughts on this particular Little Tikes playhouse are what a fantastic looking house! 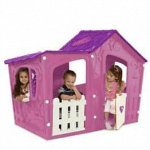 If you are looking for a traditional playhouse with the added feature of a phone, then this is the one you are looking for. At the highest end of the price range, this house isn’t packed with features but it certainly is one great looking log cabin that suits its purpose and will provide many hours of fun! I think the overall greatness is that my grandchildren love this thing. I bought it for them because I wanted them to have something to do at my house. They spend the night a lot, especially in the summer time. It is easy for me to keep an eye on them instead of them running around doing other things. They are content in this playhouse. I also thought it was nice because it is log cabin themed and my house is a log cabin so it kind of matches. They are so excited to go play in their house when they come over to visit. The price doesn’t even matter when I see their smiles on their faces. I wish the size was a little bigger but that is all that I have to say about it. My grandchildren are in love so I am content. This is just the best little traditional looking log cabin ever. This is big enough for four 3 year old’s to romp around in safely. It is very square and well laid out. It is easy as ever to clean up and it was cheap and cheerful to us. It is small enough to monitor them in it but big enough that they can play easily. It is good for indoors or out depending on the size of the space, still small enough to put inside a playroom. Assembly is easy for two people and not heavy at all.